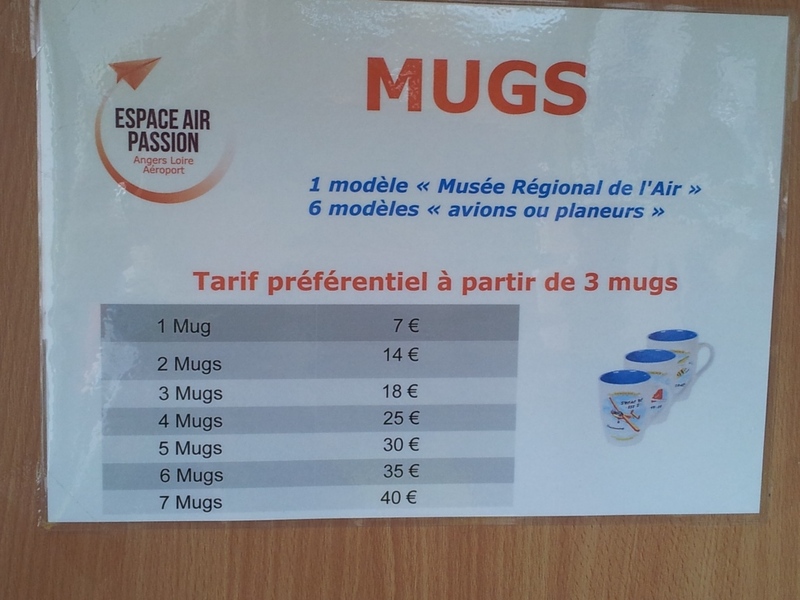 Mugs prices at the Museum Espace Air Passion. Let’s see this other example. 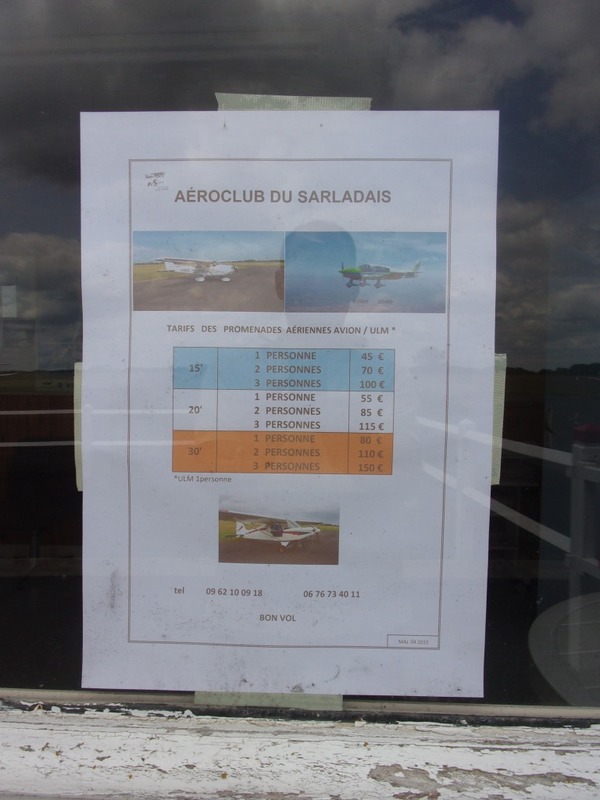 Flight prices at the Aeroclub du Sarladais. 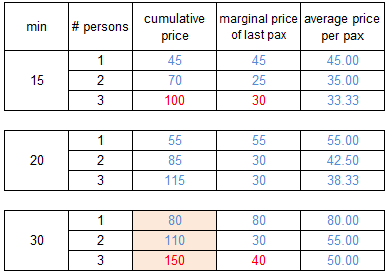 In this case, in two of the cases, the marginal price to be paid by the 3rd passenger is more expensive than that to be paid by the 2nd passenger (I highlighted them in red). 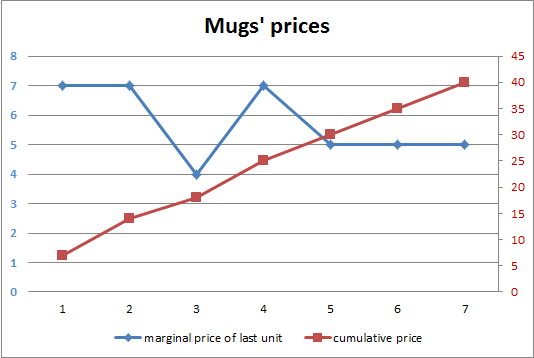 However, the oddity is not so striking as the average price to be paid by 3 passengers is always cheaper than the one to be paid by 2 passengers, thus, there is no economical incentive for 2 friends rejecting a 3rd wanting to join them in the experience of flying (good!). 15′ sell for 45€, that is 3€ per minute. 20′ sell for 55€, that is 2.75€ per minute. 30′ sell for 80€, that is 2.67€ per minute. 20′-15′ = 5′, for 55€- 45€ = 10€, that is 2€ per minute. Four years ago, when I first wrote a blog post about the different NGOs that I supported, I briefly discussed the dire situation of Official Development Assistance (ODA) based on the OECD report from 2005. […] Lester B. Pearson (PDF, 40KB), former Prime Minister of Canada, who in 1969 recommended that resources equivalent to a minimum of 1% of the GNP of developed nations should flow to developing countries. This 1% would be made up of official development assistance, other official flows from the government, and private sector flows; the official development assistance component of the 1% commitment would be equivalent to 0.7% of GNP. 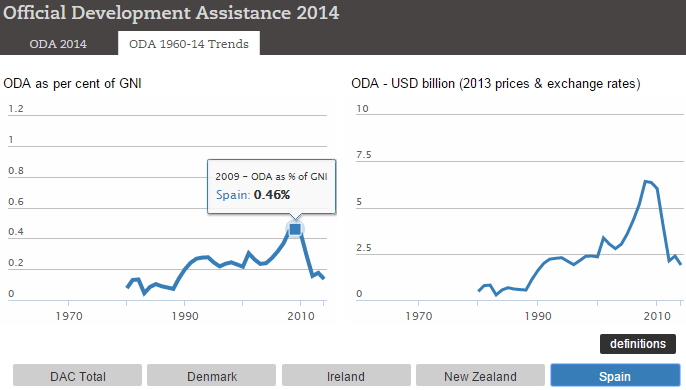 OECD Official Development Assistance, 2014 data. 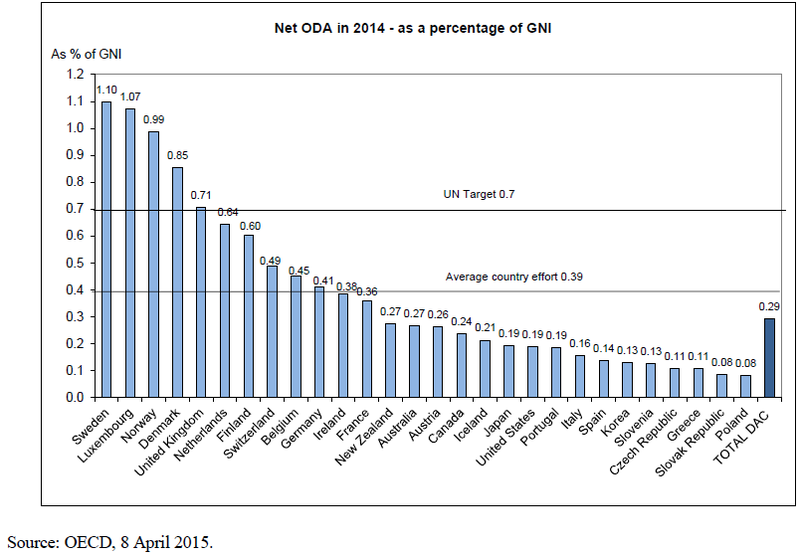 In the graphic you can see that still today, as it was the case 10 years ago, only 5 countries (Denmark, Luxembourg, Norway, Sweden and the UK) exceeded the United Nations target of keeping ODA at 0.7% of GNI (the UK has taken the place of The Netherlands). In absolute terms, the bigger donors are the USA, the UK, Germany, France and Japan. The total net ODA from member countries of the Development Assistance Committee (DAC) was 135.2bn$ (practically the same as in 2013) or a 0.29% of the gross national income (GNI) of those countries. 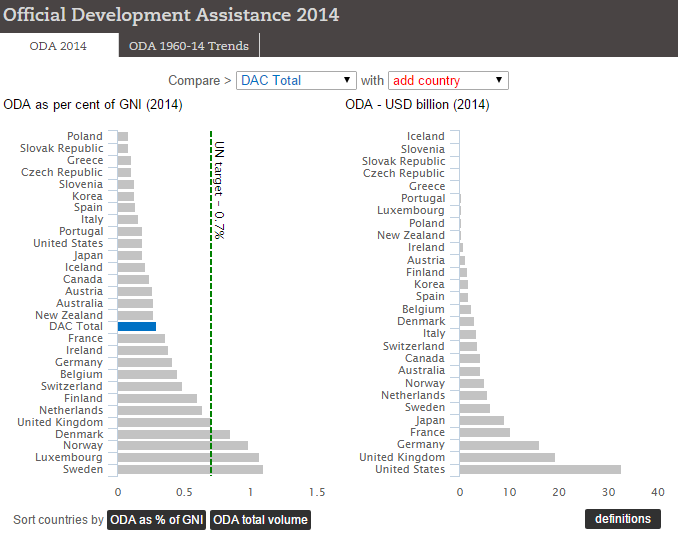 OECD ODA 2014, target, average country effort and total DAC. 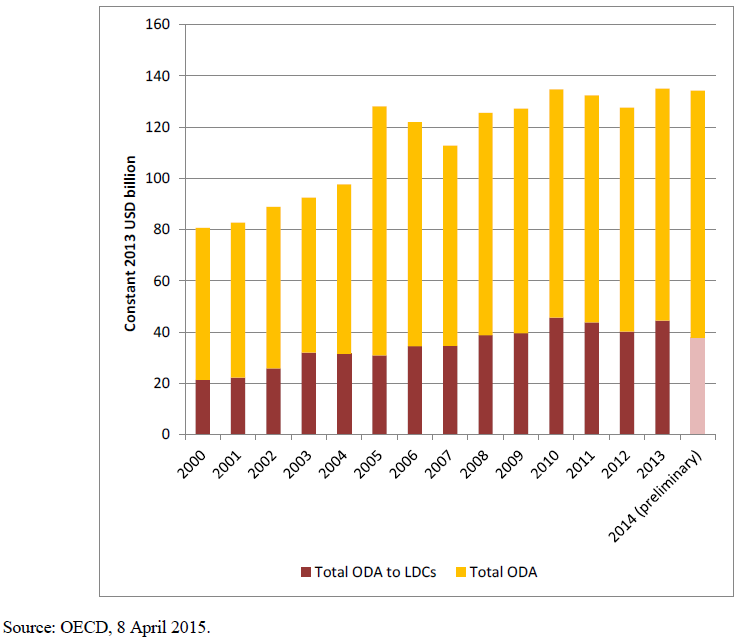 In the graphic below you can see the evolution of the total ODA in the past years, which with the crisis has suffered from continuous up and downs. Finally, using the tool, I dived into the case of Spain (my country of origin). You can see that Spain’s official development assistance contributions peaked in 2008-2009, when it reached 0.46% and 6.41bn$. The crisis then took its particular toll in Spain and priorities were redefined by the political class, almost completely forgetting about ODA. In the 2014 it contributed 1.89bn$ which represented 0.14% of the GNI, or a fifth of the UN target. Spain’s ODA evolution in relative (% of GNI) and absolute ($bn) terms. A few days ago I read an op-ed at Project Syndicate by Harvard professor Michael E. Porter titled “Why Social Progress Matters“. In it he defends the case for seeking social progress not as opposed to economic progress but to complete it. Where there is an imbalance between economic growth and social progress, political instability and unrest often arise, as in Russia and Egypt. Lagging social progress also holds back economic growth in these and other countries that fail to address human needs, build social capital, and create opportunity for their citizens. Countries must invest in social progress, not just economic institutions, to create the proper foundation for economic growth. I invite you to play with the tool available at Social Progress Imperative website. You can see what place your country of origin or residence ranks in each of the indicators, the consolidated indicators or the more global SPI (DEN #8, NL #9, GER #14, ESP #20, FRA #21). […] Paraguay, for example, has adopted the SPI to guide an inclusive national development plan for 2030. And the SPI is being used not just at the national level, but by regional and municipal authorities as well. States such as Para in Brazil, along with cities like Bogota and Rio de Janeiro in Latin America and Somerville in the US state of Massachusetts, are starting to use the SPI as a measure of development success. 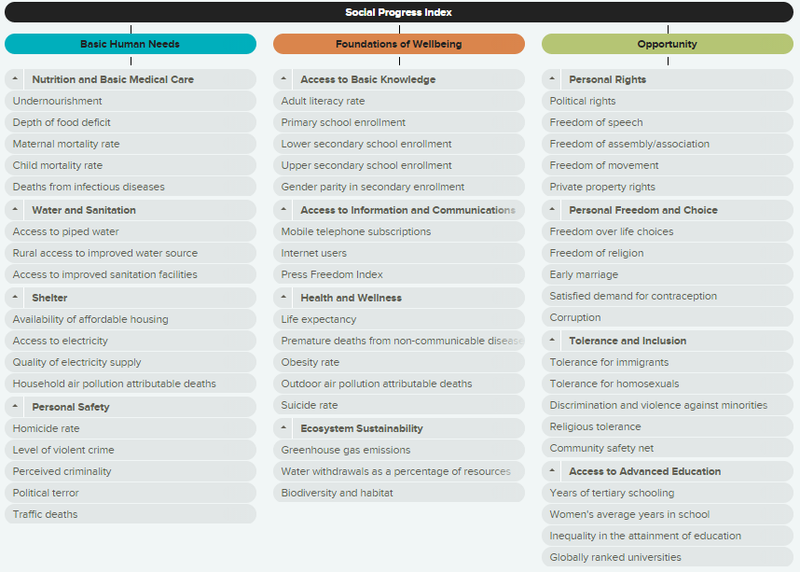 […] Measuring social progress offers citizens and leaders a more complete picture of how their country is developing. And that will help societies make better choices, create stronger communities, and enable people to lead more fulfilling lives. I see that the debate on inequality is picking up, the concern for climate change is widespread, interest in sustainable development goals is rising… hopefully all these converge into increasing social progress and the dividends of the technological advances can be enjoyed by more. I see this SPI can indeed be an interesting and useful tool.